The government is set to publish the first in a series of technical notices designed to prepare the UK for the possibility of a no-deal Brexit. Brexit Secretary Dominic Raab said securing a deal was still "the most likely outcome" - but added making alternative arrangements was the "responsible" thing to do. The European Union has already produced 68 technical notices of its own. What do the EU's 'no deal' preparations say? What would a 'no deal' look like? Mr Raab - who travels to Brussels this week to continue negotiations with the EU - said the advice was necessary to "mitigate the risks and make sure the UK is ready to make a success of Brexit". He added the government wanted to "clearly set out the steps that people, businesses and public services need to take in the unlikely event that we don't reach an agreement" with the EU. 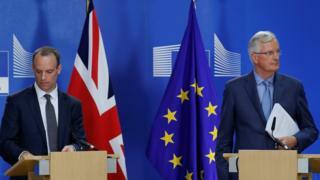 Downing Street described the advice due on Thursday as "sensible, proportionate, and part of a common sense approach to ensure stability, whatever the outcome of talks". The day will also see Mr Raab make a speech in Westminster to outline the government's plans for the possibility of leaving the EU without a deal in March next year. Downing Street said it wanted to ensure "consumers and businesses are not harmed" by the possibility of no deal being agreed.